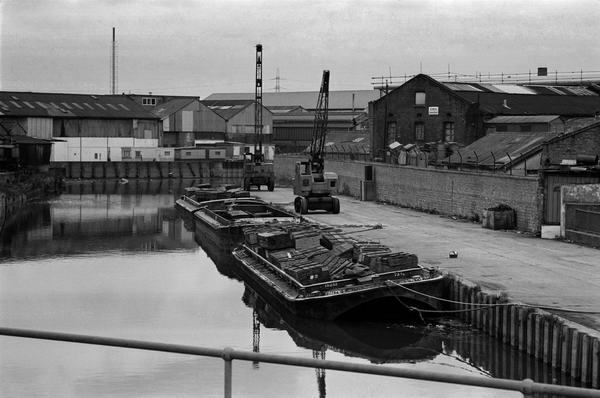 From the East India Dock Road, Bow Creek goes up past the site of the former West Ham 'B' Power Station to Bow Locks, where the Lea Navigation starts and continues north to Hertford. The Limehouse Cut also starts here giving an alternative route to the River Thames at Limehouse, avoiding the long detour around the Isle of Dogs for those heading upstream on the Thames. 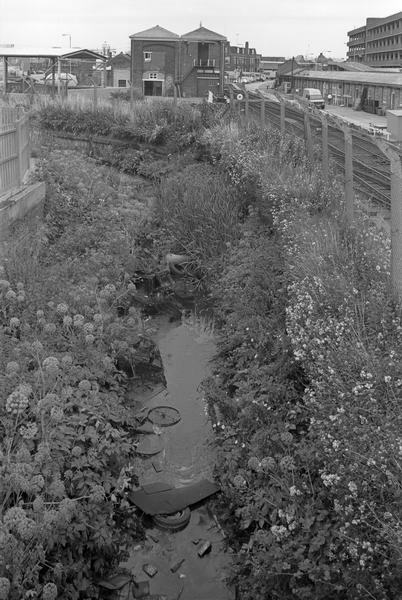 The river runs alongside the canal before widening into several streams at Three Mills. There were two channels under the tide mills themselves (the third was a windmill, but burnt down.) Another channel - the Channelsea River - runs off the the east. A short way along a wide channel dug for flood (and unemployment) relief in the 1930s, the Prescott Channel, runs north. It was built with sluice gates and not intended for navigation. 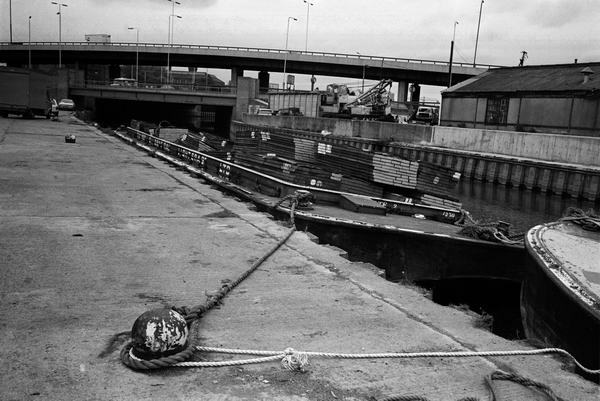 These were removed some years ago and have recently been replaced by a double lock with sluice gates, part of a scheme allegedly to relieve the roads in the area during Olympic construction by the use of water transport, but probably to prevent the flow of storm sewage releases upstream on the tide and to make upstream riverside sites more attractive to building developers. The Channelsea River is now mainly a tidal creek, ending at the Northern Outfall sewer (the Greenway), with only a small flow if any culverted under the west side of Stratford. North of Three Mills one channel of Bow Creek leads to an overflow from the Lea Navigation. The larger Three Mills Wall River is now blocked by a sluice, built in conjunction with the new Three Mills Lock on the Prescott Channel.There seemed to be no flow through this sluice when I was last there. A few hundred yards north this joins the Prescott Channel and the combined river runs under the HIgh Street. There is still some industry in this area, although several large factories, Stratford Market and the ticket factory have been demolished and replaced mainly by flats. There is also a large Jubilee Line tube depot and some warehousing. Two spectacular buildings are the Victorian Abbey Mills 'cathedral of sewage' (sadly its two free-standing moorish chimneys were thoughtlessly castrated at the start of the Second World War) and the modern pumping station that has replaced it. 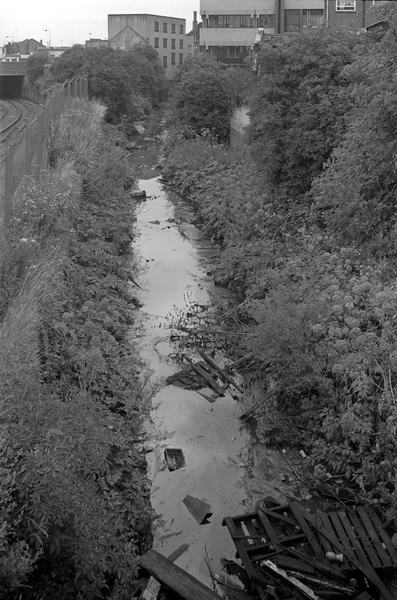 The Northern Sewage Outfalll which runs through the area gives some good views and is a useful path to West Ham station for anyone walking to the Olympics. So like the section to the north of the High St it will be resurfaced and neatened, taking away much of the pleasure of walking along it. For the moment at least, I have left out most pictures taken around the Sugar House Lane and Burford Road areas.